Special thanks to Miranda Paul for this guest post. Miranda is an award-winning author of more than a dozen fiction and nonfiction books for children. 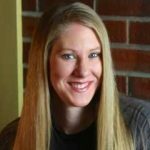 She’ll join Jennifer Swanson and Heather L. Montgomery as faculty for our Nuts & Bolts of Science Writing workshop, June 9-13, 2019 at the Highlights Foundation Retreat Center in Pennsylvania. Learn more about Miranda at the end of this post, and learn more about the workshop here. A 32-Page Picture Book for Pre-Teens? I’m currently on a book tour for my new 32-page picture book—the type of book that the Internet, most agents, and editors typically say should be “geared toward 4-8 year-olds.” But 75% of our tour stops are engaging with kids ages 8-12, or grades 2-6. At several schools, we didn’t even stop to see the Kindergartners or first graders! 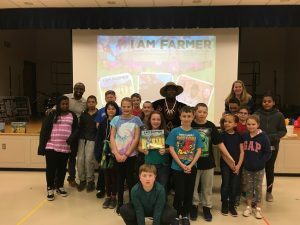 In fact, we’ve spoken to hundreds of middle schoolers about our new picture book I Am Farmer: Growing an Environmental Movement. How can that be? Pre-teens reading a picture book?! YES! Contrary to what you may have heard, not all picture books are (or should be) geared toward the youngest listeners. In fact, some of my STEM books—such as One Plastic Bag or Nine Months: Before a Baby is Born—continuously draw letters from grandparents and retired teachers who remark that they bought or pre-ordered a copy for themselves or as a gift for another adult in their lives. My picture books have ranged from 147 words to 1,400 words. Some teachers have begun labeling picture books as “E for Everyone.” As a former teacher, I like this approach. 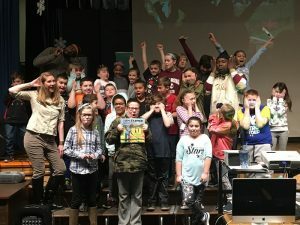 Picture books provide illustrated “mirrors” or characters and subjects that connect directly to their lives and cultures. Historical picture books or ones rooted in extremely weird or offbeat science offer “windows” that allow kids or teens to escape their reality or expand their limited experience. 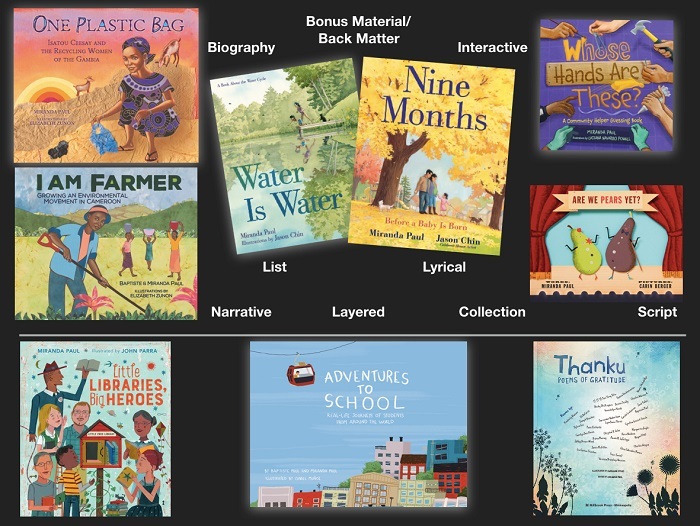 The range of choice now offered in trade STEM/STEAM nonfiction and informational fiction picture books allows teachers to be successful in reaching a broad range of kids—especially hooking that reluctant reader. Above all, picture books provide a visual format that is less intimidating than other formats, they appeal to visual learners or English Language Learners, and picture books offer higher success rates in terms of the number of students in a class who will be able to complete and engage with that book (as opposed to longer novels). Whenever I teach a course on writing for children, I go over the so-called “rules” of writing, and then the many, many exceptions. When it comes to word counts and target ages for picture books (especially nonfiction), I caution writers not to subscribe to hard and fast limitations. Rather than sticking too rigidly to word count, it’s best to strive for a manuscript in which the function and the format work together. Here’s a general guideline I sometimes use for fiction board books for babies and toddlers to picture books for upper elementary and middle-grade learners. ages 9-13 = at/under 2,000 (picture book or photographic nonfiction – 32-48 pages – but also consider making a chapter book, graphic novel, or illustrated/photographed informational 48-80 page middle grade if you’re writing exclusively for this age range. Word counts for chapter books and middle grade can range from 1,500-30,000 or more). *These word counts are my personal references – they are not official, and do not include back matter, which is bonus material for the reader or information geared for parents, teachers, or older readers. **For nonfiction books, word count guidelines are more flexible, sometimes even double the word counts listed here. If you’re working on a nonfiction picture book or an informational or educational picture book that deals with science, technology, engineering, math, or nature–I hope you’ll join us for the Nuts and Bolts of Science Writing workshop this year. We’ll learn that there are just as many formats to try out as there are ideas in our heads, and word count doesn’t always matter as much as you think. Plus, if you join us this summer, you’ll get to see first hand how no one is ever to old to learn from or fall in love with picture books (and many other formats)! We’ll be learning the rules and then how to break them intentionally and successfully. Isn’t that what rules are for? Miranda Paul is an award-winning author of more than a dozen fiction and nonfiction books for children. One Plastic Bag, Water is Water, and I Am Farmer were all named Junior Library Guild selections and her book Whose Hands Are These? was a 2017 ILA Teacher’s Choice. Her 2019 STEM picture book Nine Months, illustrated by Caldecott Honoree Jason Chin, releases April 23 in four languages. This year also marks the release of Little Libraries, Big Heroes (illustrated by John Parra) and her editorial debut, Thanku: Poems of Gratitude, an illustrated collection of poetry featuring 32 celebrated children’s writers. Learn more at www.mirandapaul.com.